Carmelo Anthony's 62-point game against Charlotte Bobcats (Video) - Balita Boss! New York Knicks small forward Carmelo Anthony scored 62 points on Friday (Saturday in the Philippines) at Madison Square Garden as the Knicks beat the Charlotte Bobcats 125-96. Melo’s 62 points is a career-high for him. It’s also the Knicks franchise record for most points scored in a game, surpassing the 60 points of Bernad King on December 25, 1984. 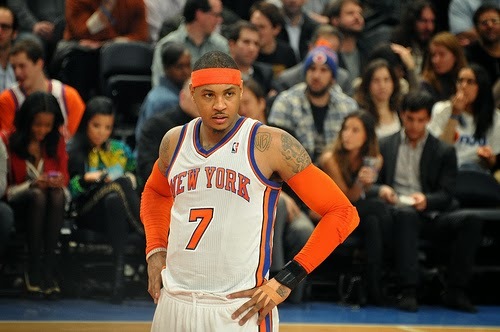 Anthony also surpassed the 61 points Madison Square Garden scoring record scored by Kobe Bryant on February 2, 2009. The 62 points by Anthony came on an efficient 23 of 35 shooting in just 38 minutes and 39 seconds of play, including a buzzer-beater from half-court at the half. He shot 6-of-11 three-pointers, a perfect 10 out of 10 on the free throw line, and also had 13 rebounds. According to NBA.com/Stats, Carmelo Anthony was the first NBA player ever to reach 60 points without a turnover.